Southfield, MI, November 12, 2018 — Vesco Oil Corporation, one of the largest distributors of branded automotive and industrial lubricants in the United States and a leading provider of environmental services, has been named a 2018 Top Workplace by the Detroit Free Press. The 2018 Detroit Free Press Top Workplaces award recognizes companies that foster effective yet highly enjoyable work environments. The award is based solely on anonymous employee feedback gathered through a third-party survey administered by research partner Energage. The survey measures several aspects of workplace culture including alignment, execution, and connection. 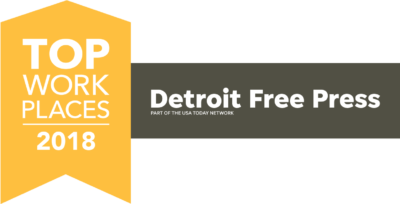 As a 2018 Detroit Free Press Top Workplaces award recipient, Vesco Oil was featured in a special section of the Detroit Free Press and was recognized at the Detroit Free Press 2018 awards gala on November 8 at the Royal Oak Music Theatre.